From: the Publisher & Amazon Vine, Thank You! Synopsis: Every year in Quill, thirteen-year-olds are sorted into categories: the strong, intelligent Wanteds go to university, and the artistic Unwanteds are sent to their deaths. 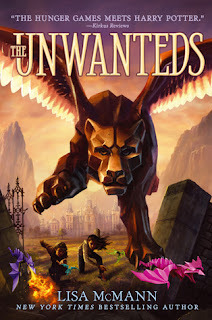 Review: 3 Stars - The Unwanteds by author Lisa McMann is a middle grade book about a society who fears creativity in any way, shape or form. With a controlling government, a drab society and a hidden colorful and magical place where anything is possible, McMann has taken the idea of cutting out all creative programs to new heights. When the Purge comes, the Unwanteds are cast out and sent to their death. The Wanteds remain behind to learn, follow rules and never step out of line. Alex and his twin Aaron will both face a different fate. One Wanted and one Unwanted. The story takes place in drab, colorless and more than harsh Quill. Alex and his brother knew the day was coming when they would be separated. Alex, the Unwanted of the two is purged from society and taken away from everything he knows, while Aaron, the Wanted brother stays behind to go to school and learn ways to better Quill and the controlling people in charge. Quill doesn’t sound like a place I’d want to live; I can’t imagine anyone wanting to stay there for long. Barbed wire covering the sky, shared buckets of water for washing… yeah, not fun, no art or being creative in anyway... yeah, no thanks! So, Alex, on his way to his death gets a shock when he, along with all other Unwanteds from his purge are saved and taken to a colorful, artistic and magical place called Artime. The best part of the story was watching the characters change as they learned that expressing yourself through art isn’t a bad thing and it should be encouraged instead of taken away. Taking a persons creativity away takes away too much of who they are, what they are and what they will become. The whole idea for the story was great… being punished, taken away and killed because of being creative in any way; I couldn’t wait to read where McMann would take the idea. And yeah, she did run with it. However, I felt it was a tad flat. I didn’t connect with the characters at all. I tried throughout the whole story to find something to grasp onto, but... just couldn’t. And no, I’m not saying this is a bad book in any way, it was a great idea and a pretty entertaining story. This is my first time reading anything by McMann, and I know it won’t be my last. I have heard nothing but amazing things about her YA series. I look forward to reading more from her in the future. I thought that McMann was way to obvious with the differences between Quill and Artime - like she felt she had to lead her readers step by step through the story. But she had a really creative idea and it was a fun read. I think that younger readers would be a bit more forgiving and it's a great intro to the dystopian genre. We've ordered it for the elementary library, I think my older kids will enjoy it.